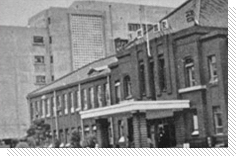 Since 1952, Chungnam National University has been striving to become one of the top universities in the nation and world. Today, over 190,000 alumni have been taking an active role in serving and contributing to reach this endeavor. 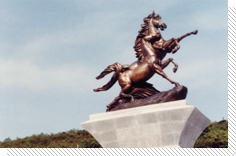 Chungnam Provincial University is established with three colleges: Liberal Arts Sciences, Agriculture, and Engineering. Chungnam National University celebrates its first anniversary. The Graduate School is established. Chungchong National University is established, unifying Chungnam Provincial University with Chungbuk Provincial University. 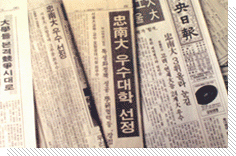 Chungnam National University is reorganized as a separate institution from Chungbuk University. 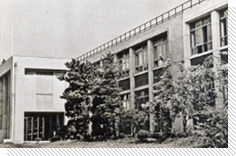 College of Law & Business Administration is established on November 30, 1967 College of Medicine is established. Administration Building, Graduate School, College of Economics & Management, and College of Law is moved to the Daedeok campus. College of Agriculture is moved to the Daedeok campus. College of Engineering Education reorganized into Division of Engineering Education and General Engineering Division. Graduate School of Education is moved to the Daedeok campus. University Hospital is built and opened. College of Sciences is divided into the College of Natural Sciences and the College of Home Economics. College of Fine Arts and Music is established. Administration Building, Graduate School, College of Economics & Management, and College of Law are moved to the Daedeok Campus. College of Engineering Education is reorganized into the Division of Engineering. Education and the General Engineering Division. College of Medicine is moved to the Boun campus. Graduate School of Public Health is established. College of Sciences and Graduate School of Industry is established. College of Veterinary Medicine is established. Chungnam National University is selected as a State Policy University. CNU is evaluated as a Superior University in the University Accreditation Assessment. CNU is selected as a Superior University in the Educational Revolution Assessment. CNU is selected as an Exclusive College in Basic Sciences. CNU is selected as a Superior University for the Cyber University Project. The Lifelong Education Center is opened. CNU is selected as a Host School for Brain Korea 21. Patent Law School is established. College of Agriculture is reorganized as the College of Agriculture and Life Science. Graduate School of Peace & Security is established. CNU is selected as a Superior University in National Universities? ?Development Project. School of Bioscience Biotechnology is established. College of Liberal Arts is reorganized as the College of Humanities. 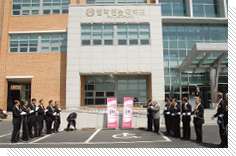 National Cancer Center at Chungnam National University is established. CNU is funded by the NURI project 2005. CNU is chosen as a leading university in structural reform. The Center for Teaching & Learning is established. The Office of International Affairs is relocated and opened. Chosen for fifteen projects including BK21 in 2006. Chosen as NURI in 2006. Youngdong Academic Forest of College of Agriculture and Life Sciences opened. The National Defense Institute is established. The Software Research Center is changed into the Software Institute. CNU Faculty Council is established. CNU is selected as an excellent library for the Contribution to the Joint Application of Academic Information. CNU is selected as an E-learning Support Center (Daejeon & Chungnam area). Ji-Hwan Kim is appointed Acting President. Inauguration of the 16th President, Yong-Ho Song. CNU is designated as one of the universities authorized to establish the Law School. Law School, Graduate School of Medicine, and Graduate School of Analytical Science and Technology are established. College of Education, College of Nursing, Faculty of Liberal Arts and College of Biological Sciences and Biotechnology are established. CNU is designated as National 5+2 Supra Economic Region Leading Industry Brain Training Project. Graduate School of Drug Development & Discovery, Graduate School of Green Energy Technology, Educational Development Institute are established. Education Center for Creative Future Engineers is established. 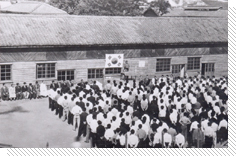 Inauguration of the 17th President, Sang-Chul Jung. CNU is designated as Leaders in INdustry-university Cooperation(LINC). CNU held the Second Rank in a Nationwide Reinforcement Projectr of Educational Capacity. CNU is designated as Expertise Cultivating Project in Energy Recovery from Waste. Graduate School of National Public Policy is established. CNU is chosen for Brain Korea 21(BK 21). Strategic planning department is established. Faculty of Military Studies is established. CNU is chosen for Leaders in INdustry-university Cooperation(LINC, Phase 2), Advancement of College Education(ACE), and University for Creative Korea(CK). Safety Management Headquarters is established. CNU is chosen for Supporting High School Education Project. Physical Promotion Program Management Committee is established. CNU is chosen for POINT. Inauguration of the 18th President, Deog-Seong Oh.